See ya, winter: Baseball is back! Start the new season off in life-saving style! Get 2 free tickets to Lebron James Reversible Jersey Night, Saturday, April 20 at San Manuel Stadium, home of the Inland Empire 66ers. Just donate blood April 17, 18, 19 or 20 at LifeStream’s nearby San Bernardino Donor Center, 384 W. Orange Show Road – and be sure to give the code “BASEBALL.” Game time is 6:05 p.m.
Make an appointment to donate today by calling 800.879.4484 or click below. Walk-ins are welcome! Can’t make it to the San Bernardino Donor Center on the above days? 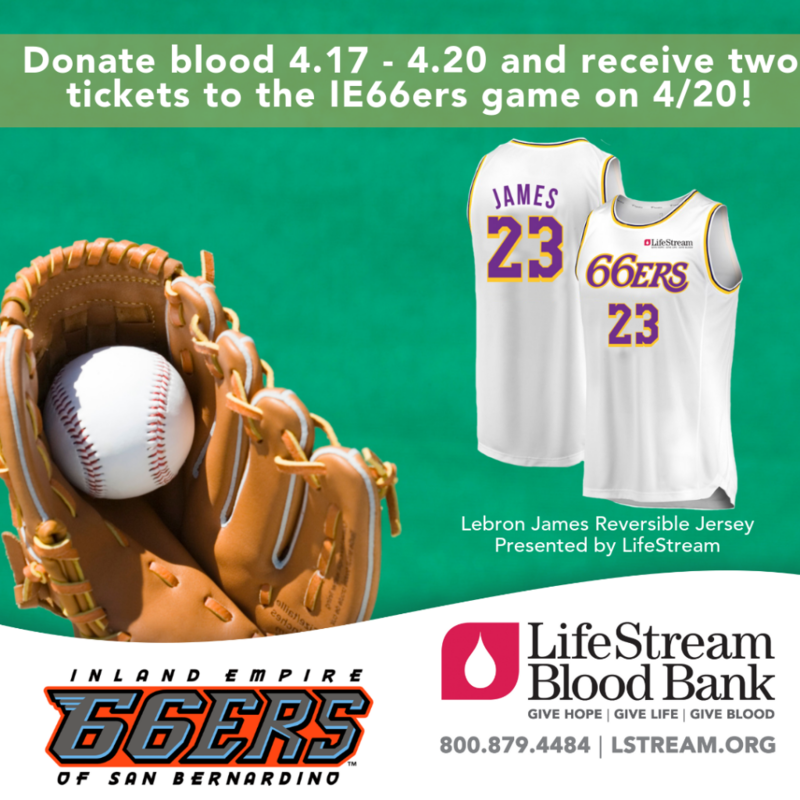 LifeStream will have a blood drive at the IE 66ers game on Saturday, April 20. Donate blood and get two-tickets to that night’s game! Plus, the first 35 donors will get a Lebron James Reversible Jersey! Call 800.879.4484 or click below to make an appointment for the blood drive. As always, walk-ins are welcome.